Tel Aviv's new King David Museum offers two fun-filled free days honoring birthday of greatest Jewish king ever. From the Beit David museum exhibit. A new museum in Tel Aviv – the King David Private Museum and Research Center, dedicated to the House of David – offers two fun-filled free days honoring the holiday of Shavuot, which is also celebrated as the 3,025th birthday of greatest Jewish king ever. The twin-day treat will take place on Monday, 21.5, and Tuesday, 22.5. It will include a lecture at 7:00 p.m. Monday by Dr. Chaim Luria on genealogy and King David's DNA, and events for children starting at 11:00 a.m. on the following day. These will include actors dressed as biblical characters who will teach the children about King David in a fun way. The museum, located on 5 Brenner St. in central Tel Aviv, opened just four months ago. 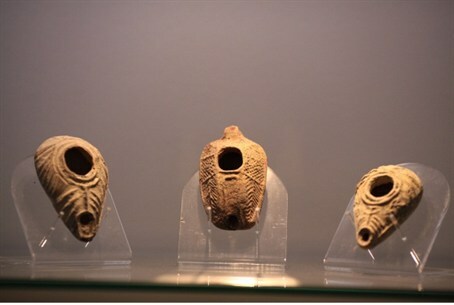 It contains archeological exhibits from First and Second Temple times and includes artifacts of special significance in the story of King David: for instance, one section displays slingshot stones found in the Emek HaEla region, where David killed Goliath with a single accurate stone to the head. In another room, a video shows the life of King David, from his humble beginning as a lonely shepherd until his anointment as king. Another video explains the art of lyre-making, and based on writings that describe how King David built the lyres he played. The museum prides itself on the Genealogy Center, a database that traces the descendants of King David to this very day. It is centered on Rashi, a famous descendant of David, and his progeny. It includes over 100 surnames of present-day families descended from the greatest king of all. The results of the research are presented in the museum and can be accessed through a special website. Susan Roth, founder of the King David Private Museum and Research Center, is herself a direct descendant of King David.